Location: Galeon Residence & Spa Hotel is located in the southern part of Sunny Beach, just a few minutes walk from Nessebar. The hotel is on the first line, 3 minutes from the beach. 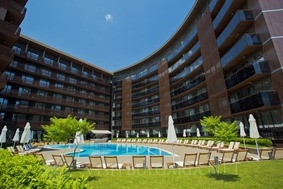 The nearest bus stop is 300 m away and the center of Sunny Beach is 1 km from the hotel. The distance to Sarafovo Airport in Burgas is 27 km. Accommodation: The rooms feature air conditioning, lounge area, minibar or fridge, flat-screen TV with satellite channels, bathroom with shower and toiletries, balcony. All apartments and studios provide self-cooking facilities and laundry. Bars and restaurants: At guests' disposal there is a-la-carte restaurant and a lobby bar with various alcoholic and non-alcoholic beverages. SPA center: The hotel's spa center offers a variety of spa treatments and massages, an indoor pool, a thermal area with a sauna and a steam bath.